Woohoo! The bathroom is 99.9% done!!! (You will see what I forgot to finish later on in this post.) I can't wait to show you all the transformation! Like everything in our tiny house, any transformation takes time. I started working on the bathroom as soon as I moved in three years ago by giving the space a deep clean. Boy, was this bathroom filthy! Here are some pictures right before move-in day. Here's one my mom took with her camera. After cleaning, next on the list was to get rid of the bright blue walls! The top picture has a more accurate depiction of how bright the blue was. 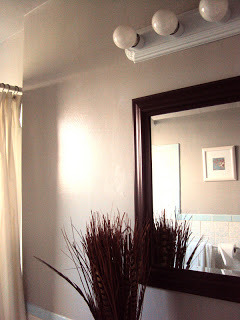 My friend, Carolyn, came over and helped me paint... She actually painted the whole bathroom for me! :) What a great friend! I went with Valspar's Urban Sunrise in a semi-gloss finish. 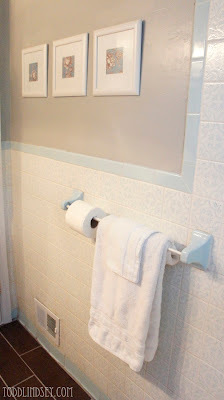 I knew that the wall tile was going to stay so I needed a pretty neutral color. 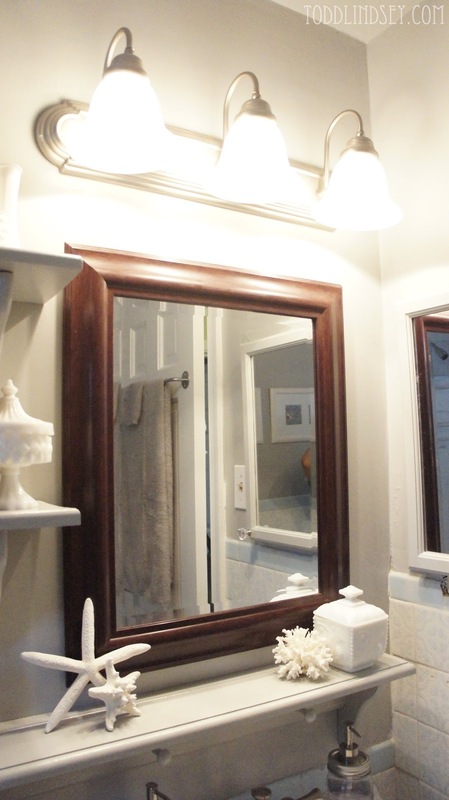 I also painted the vanity a dark brown and purchased a new mirror for only $15 at Ross. 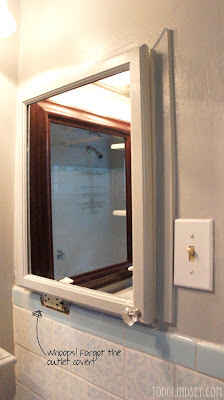 I installed a new medicine cabinet that I got for $30 at Lowes. 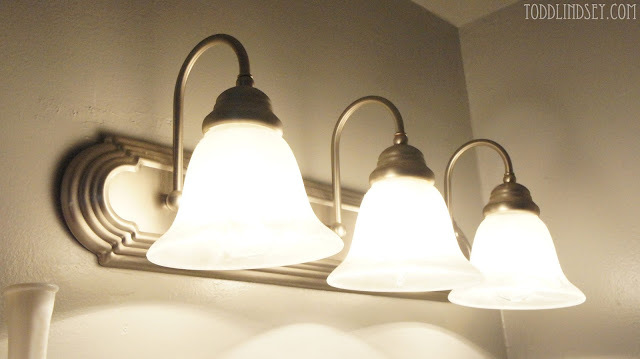 (I think that was the first thing I installed in the house!) This served as a pretty good temporary fix. 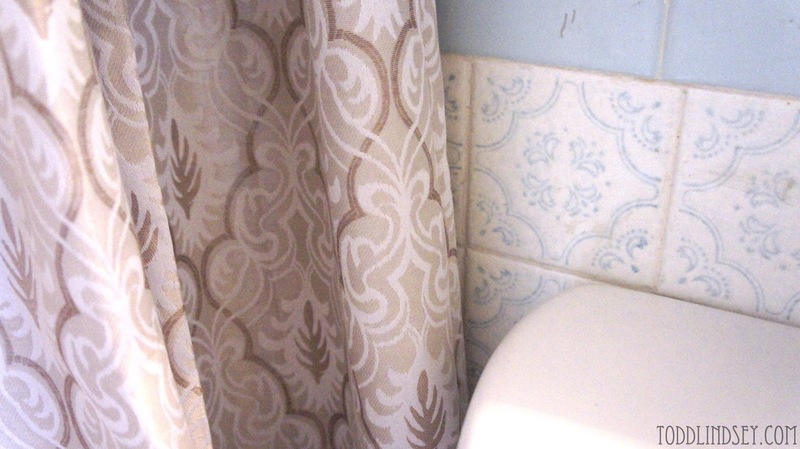 Oh yeah... and I got a new shower curtain because the one that was left behind was just plain nasty! 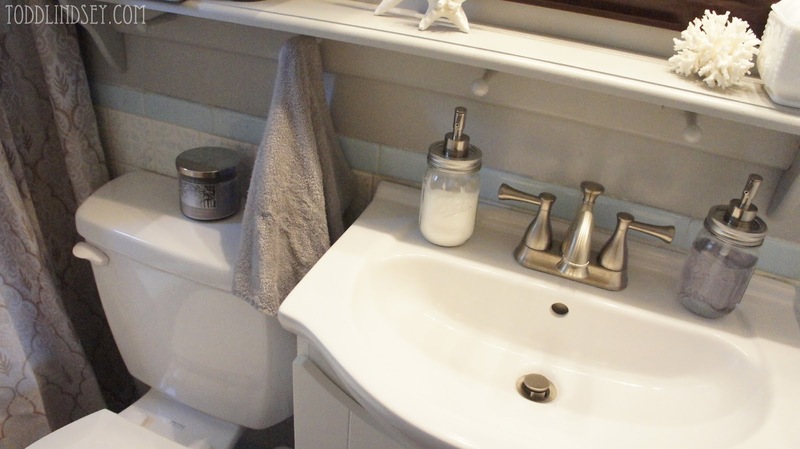 As the months passed, I started formulating a plan for what I wanted to do with the bathroom. 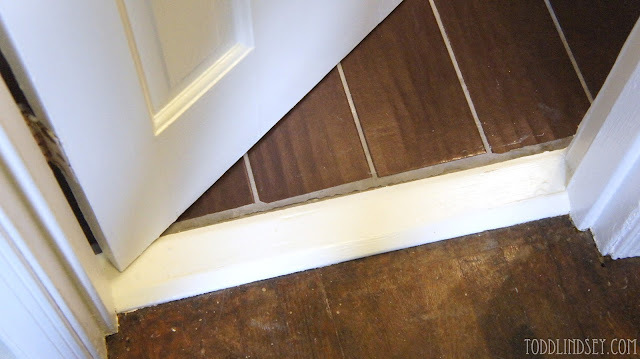 Obviously, the dated floor tile had to go. 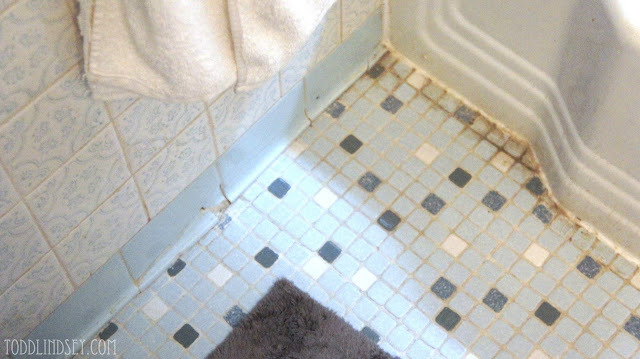 I had tried a grout stain in white to freshen up the tile but it didn't last long and just peeled off. The vanity top was way too large for the vanity base. It hung over the base and overlapped the toilet! The faucet knobs were also pretty cheap and old; I replaced them twice within the last two years. The toilet was pretty ancient; the tank was huge and wasted so much water. It was one of those toilets that kept running and running and running... water, of course. 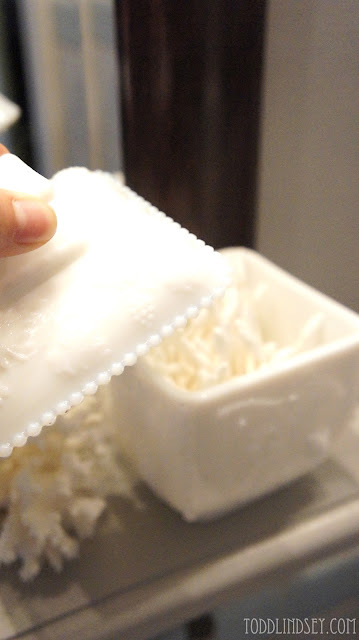 The wax seal on the bottom had disintegrated and so water would slowly leak out the bottom. It was lovely. 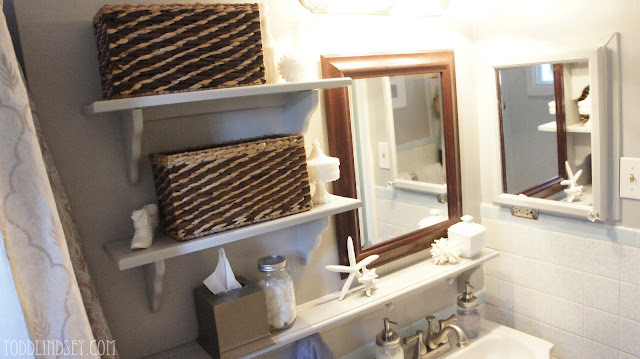 The bathroom also had absolutely no storage besides the medicine cabinet I installed and the vanity. Our countertop was constantly cluttered with stuff we needed. Oh yeah... 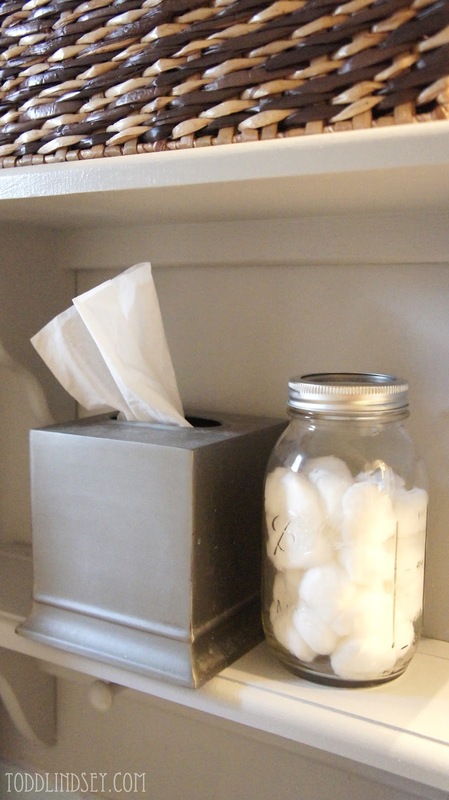 Here's our ghetto medicine cabinet. The hole was too big for the cabinet so I put some trim around the outside to cover the gaps. And so it sat. Unpainted and unfinished for three long years. Poor thing. 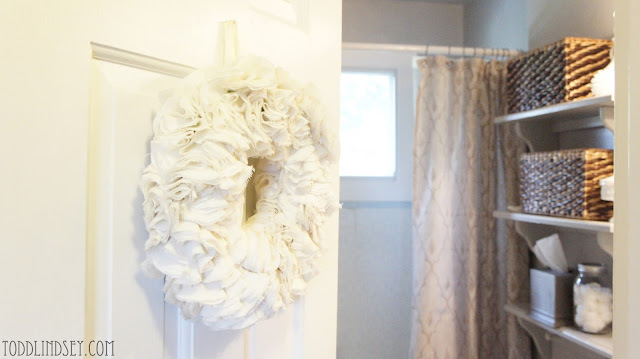 What really makes it wonderful is the suction cup wreath holder we used to hold our hand towel. Classy, right? Our bathroom also didn't have a working doorknob until Todd installed one a few months ago. What a happy day! We also don't have a toilet paper holder in the bathroom. 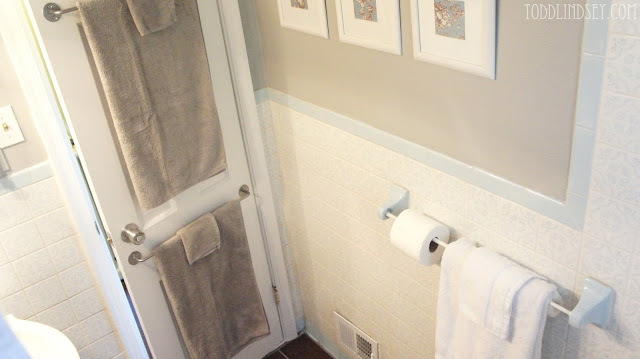 I have gone back and forth on getting a toilet paper holder that stands on the floor but we just don't have the extra square footage! So our toilet paper is happy to make a tension rod between the ceramic towel ends it's home. 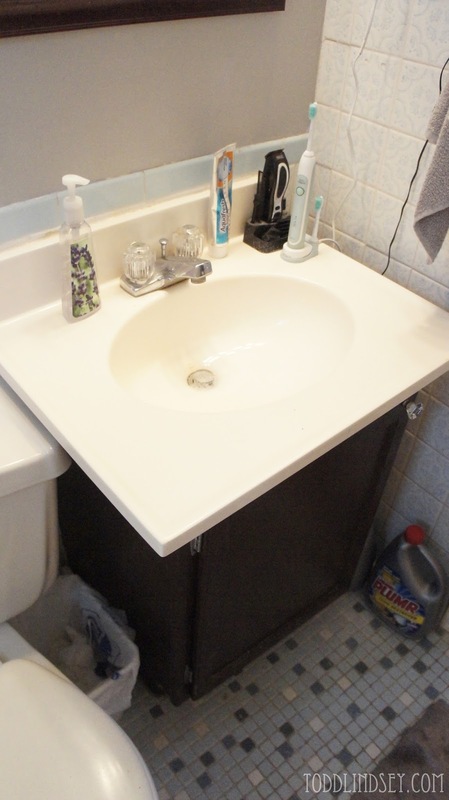 Unfortunately, that ugly mess where the sink pipes are is from the previous homeowner who thought it would be a brilliant idea to Liquid Nail the vanity to the tile wall. 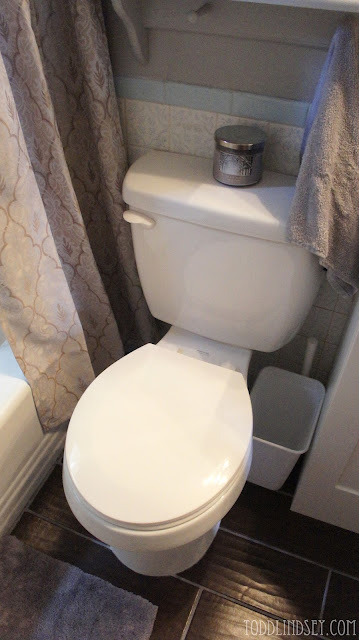 Everything was pretty smooth sailing (from what my in-laws told us) except for the the toilet installation. The new toilet wouldn't fit over the old pipe because the flange had disintegrated. (Yes, I learned a new potty word--- flange.) The concrete around the pipe was also crumbling. Yikes! 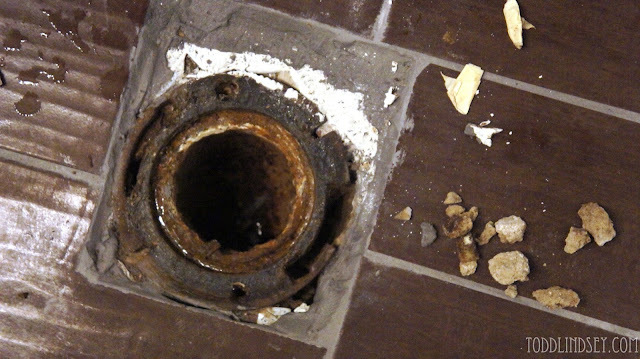 Todd's dad ended up Liquid Nailing a new flange piece and the new toilet on top of the old crumbling flange and pipe. (Yeah, I know... 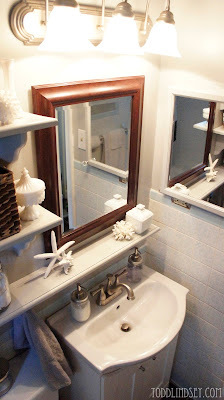 I was just criticizing the last homeowner for doing that to the vanity.) 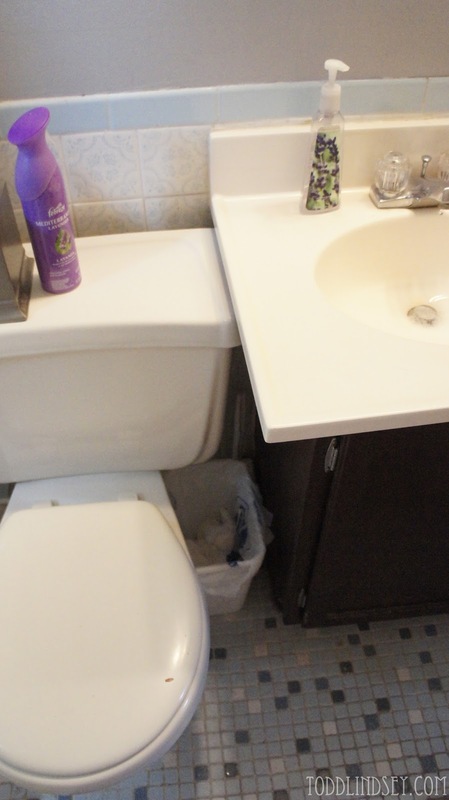 Poor future homeowners who go to replace the toilet! They will need to get all new pipes. The sink pipes also started leaking after the install. Good thing Todd is super strong! He tightened those pipes and bought a new hose for the cold water and put it in himself. I am so proud of my not-so-handy husband! :) I am happy to report that there has been no more leaking! Alrighty... On to the reveal! 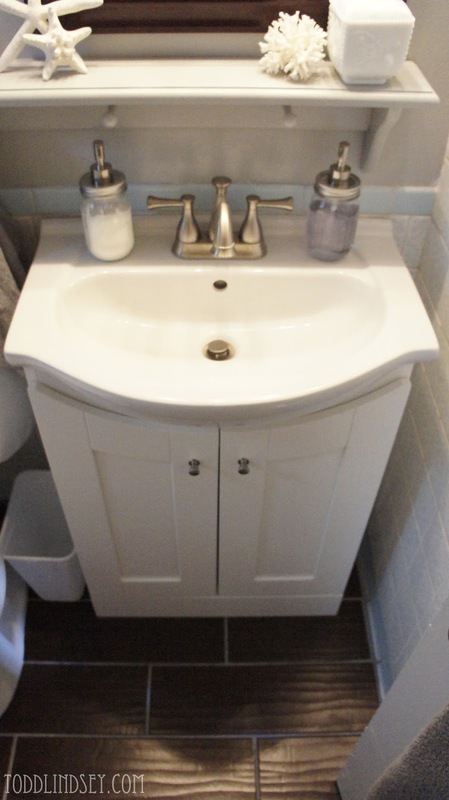 Welcome to our spiffy new bathroom! 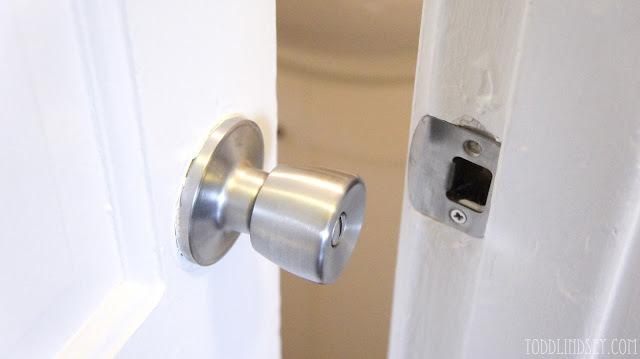 Check out that nice, shiny doorknob that works. Ahhh... Privacy. I made this Muslin Rosette Wreath almost two years ago. 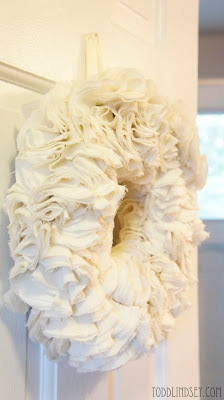 I love all white wreaths. You can move them from space to space and they will almost always match. 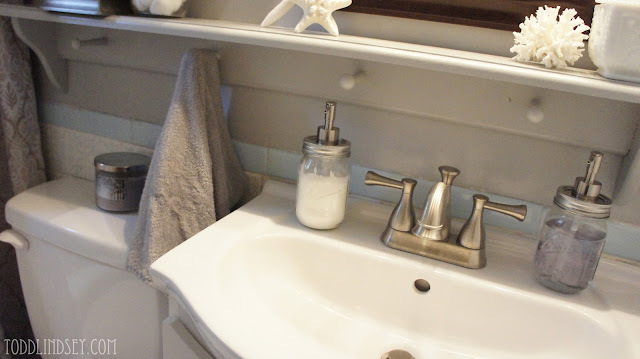 All the fixtures are brushed nickel and all the "furniture" is bright white. The other colors used were grays, creams, whites and browns. 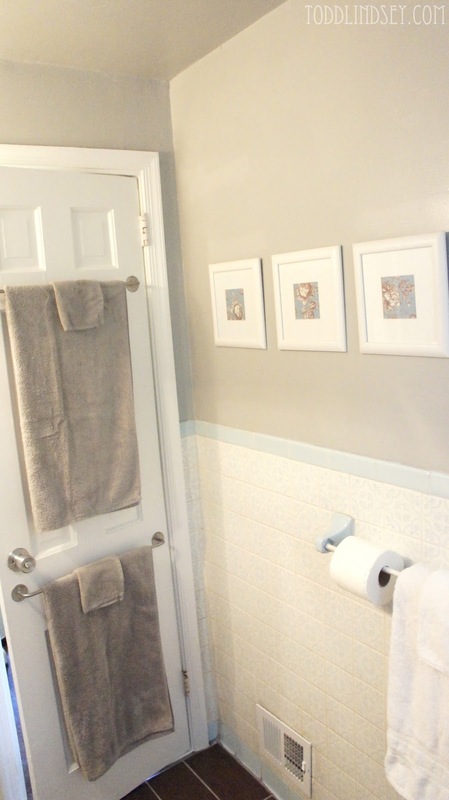 I wanted the bathroom to be more neutral and visually relaxing than the rest of the house. Country Spa? Is that a style? 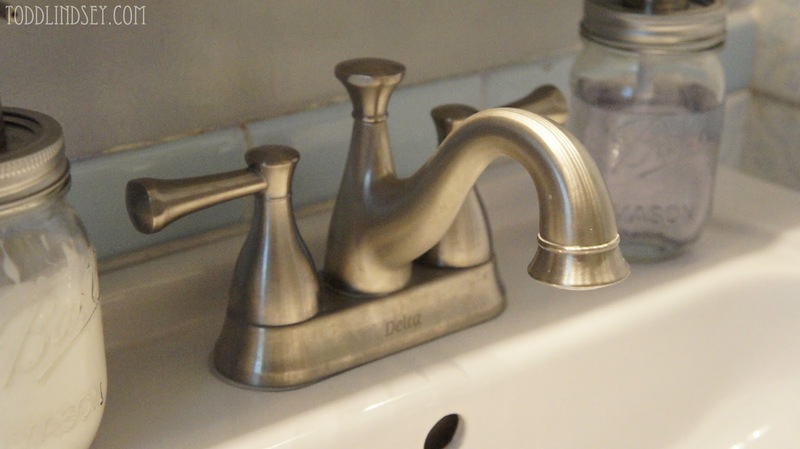 Both the light fixture and the faucet were given to us by Todd's parents. They were renovating their bathroom from one vanity to two vanities and couldn't find a match for their existing stuff. So we got their "trash"! 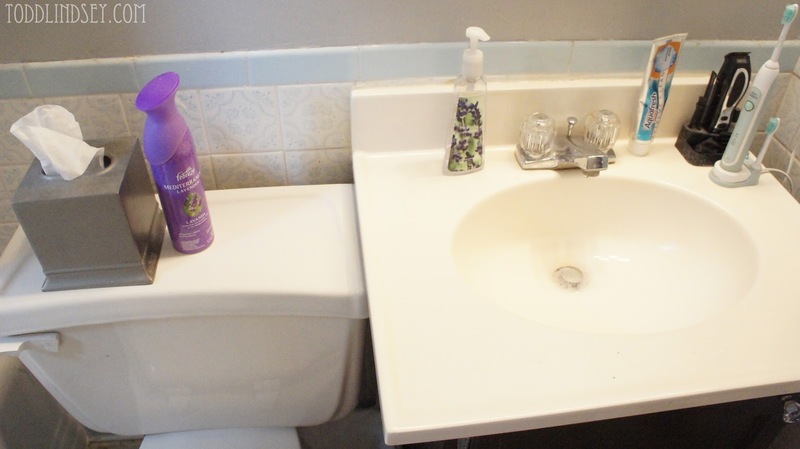 The sink we got at Lowes on sale for only $99. We also used a friend's military discount and got an additional 15% off. 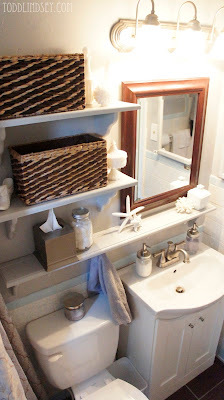 I love how we have more floor space since this vanity isn't as deep as our previous one. Our old vanity and counter went right up to the door. 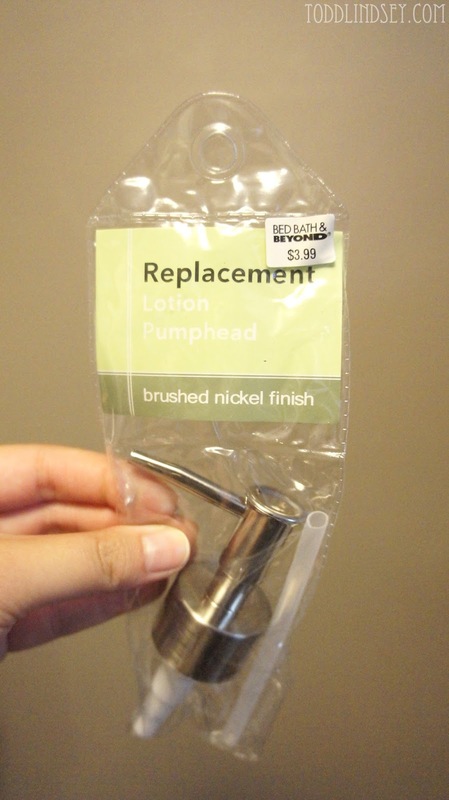 I picked up two replacement pumps at Bed, Bath & Beyond for only $4 each. (Technically it didn't cost me anything because I had a gift card.) I used two mason jars Todd and I got at a friend's wedding (party favors! 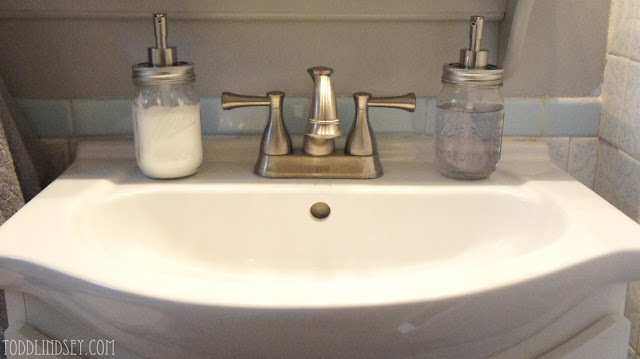 ), a drill, wire cutters and pliers and made a pair of lotion and soap dispensers for the sink area. 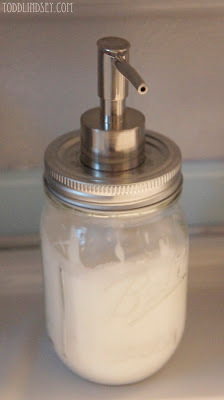 I was able to use up all my partially used lotion bottles by squeezing them into the mason jar one! Consolidation, I say! Free, I say! And goodbye suction cup wreath holder! Hello shelving with pegs! 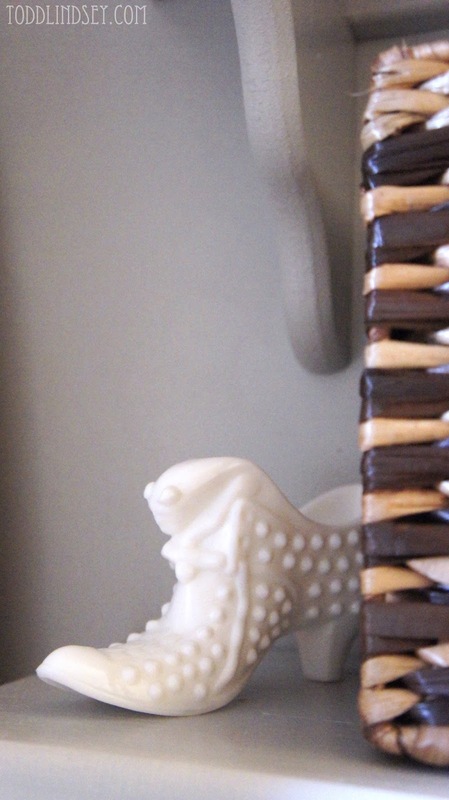 The pegs are perfect for holding towels, watches, bracelets... you name it! Now onto our gorgeous shelving. I thought about buying the supplies and building them myself but then I found these shelves online for just $40. They came unfinished and were shipped to our house for free. I painted them with leftover wall paint so that they would blend into the wall more. Oh yeah. Here's our new toilet! No running water. No loud noises. No bulky tank. Who knew a person could get so excited about a simple potty? 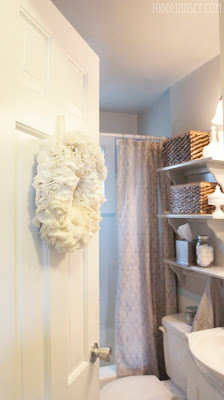 The toilet brush was 99 cents from Ikea and the trashcan a buck from The Dollar Tree. Now let's check out what else is on those shelves before I get even more distracted. I am finally able to display our purchases from last year's Myrtle Beach trip! 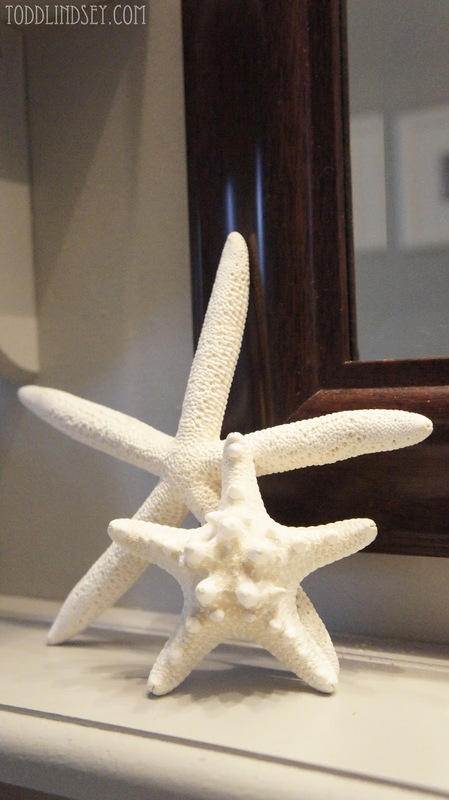 I got some white starfishies, a round shell thing and a small coral. 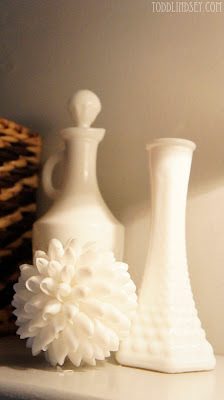 And these are cotton balls in a mason jar left over from our wedding. (The jar was left over, not the cotton balls.) And a tissue box I had back in my first apartment. Nothing exciting there. 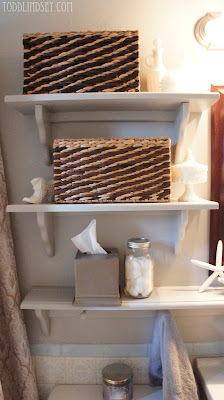 The medicine cabinet got a makeover too! I painted it the same as the wall color so that it wouldn't be so visually conspicuous. I also added a glass knob I already had from a previous project. 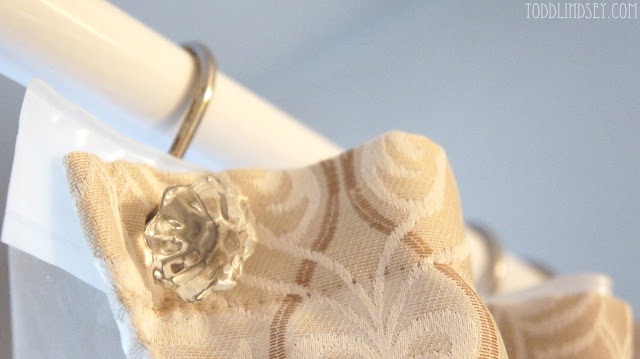 I like how it matches the shower curtain hooks. So. Funny story about this shower curtain. I was planning on keeping the white one I had bought when I first moved into the house. It was still in good shape, despite some mold spots. 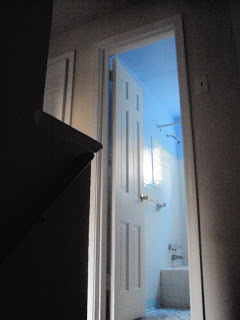 (We don't have a fan in the bathroom so it gets pretty humid. And stays pretty humid.) 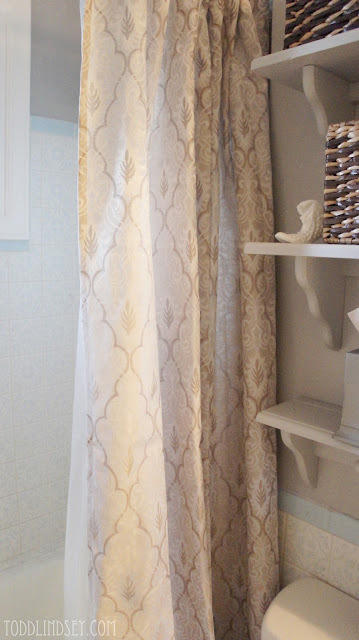 I followed the bottle directions and bleached the curtain in the wash, hoping it would come out sparkly white. And it didn't. It came out looking like it died in a drive by. Black mold circles still there with holes eaten through the middle of each one. Time to shop for a new shower curtain! I picked out this one at Target. I like how it tied the brown and gray together and mimicked the tile pattern. I also liked how it was on sale for $2 off. We also got rid of the fabric liner we had been using. I really like the look of a fabric liner... It looks so much nicer than those cheap plastic ones. 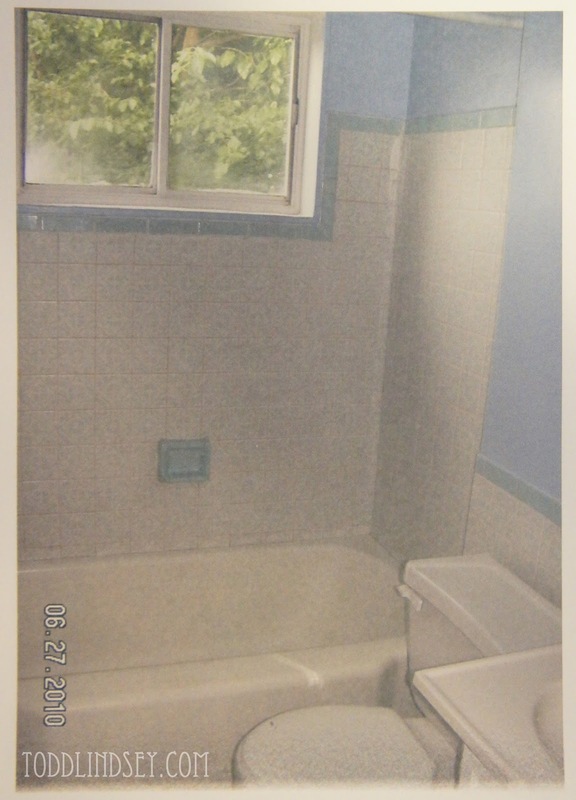 But our issue was that the water kept soaking right through the fabric liner and would pool on the floor outside of the tub. Not cool. So now we are back to using a cheap plastic liner. Having dry floors is pretty worth it though. 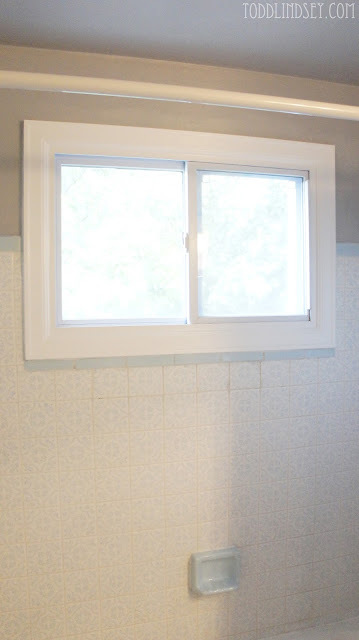 Do you remember when we got a new window last summer? Here it is. 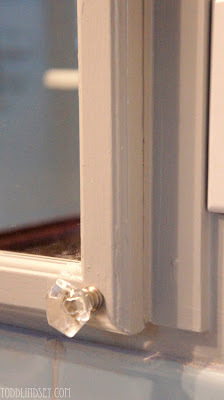 I finally got around to painting the trim white... a whole year later. And for now, the tub will remain the same. No makeover, poor thing. It's too large to take out without knocking down walls. It's too expensive to get a liner. 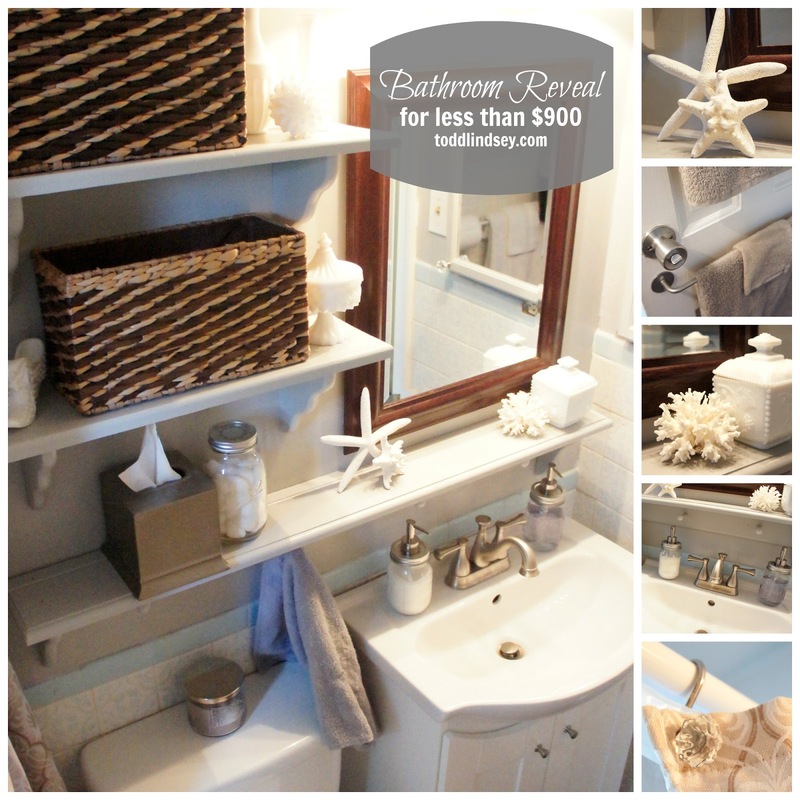 (We got an estimate from Bath Fitters for $2,000... Just to start with!!!) It's too toxic to paint. Any suggestions? 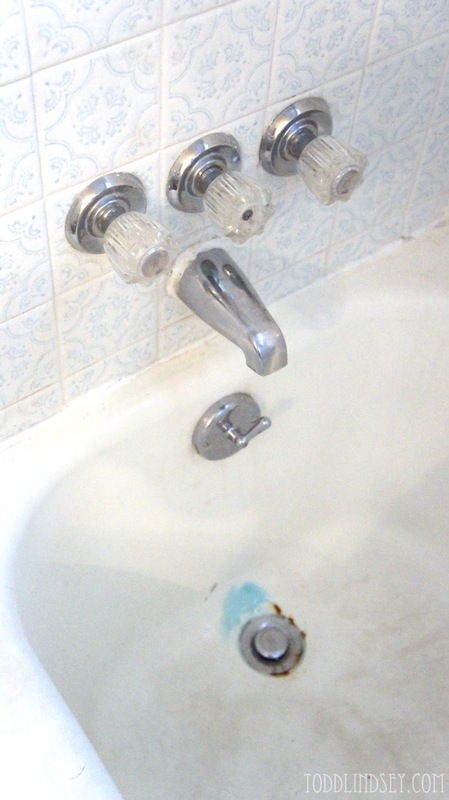 Has anyone gotten their tub refinished before? Does it last? 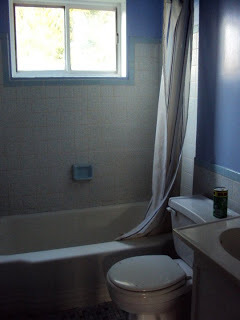 We also need new hardware for the tub but that will wait until we decide what we are going to do with it. 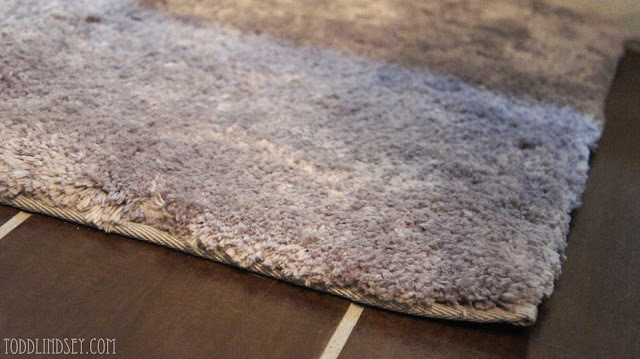 And one of my "splurges" for the bathroom: a rug. A super soft, squishy rug. The most expensive rug in the rug aisle (for that specific size). We needed a new rug because all of ours were too big for the space. We got this at Bed, Bath & Beyond for $16 with one of those 20% off coupons. We also used a gift card sooo I guess it's not really a splurge after all. 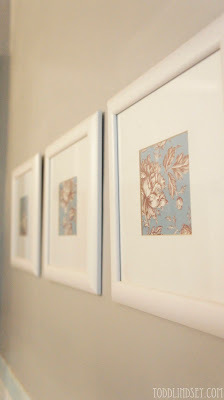 The other side of the bathroom has three white frames displaying one piece of scrapbooking paper that I cut up. 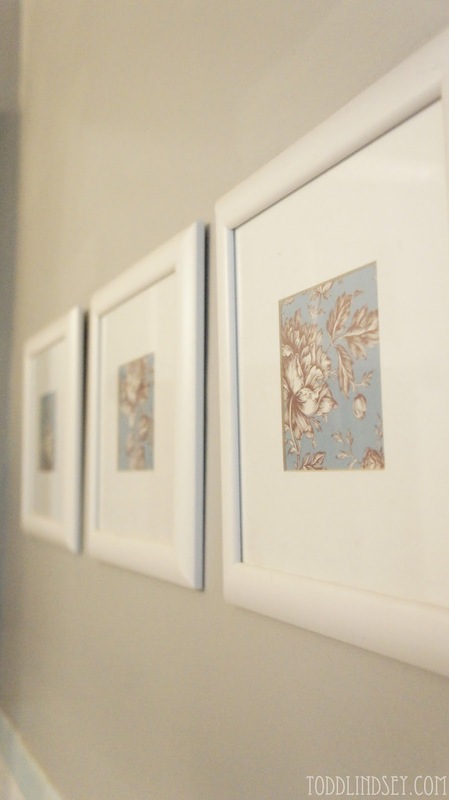 Cheap art! 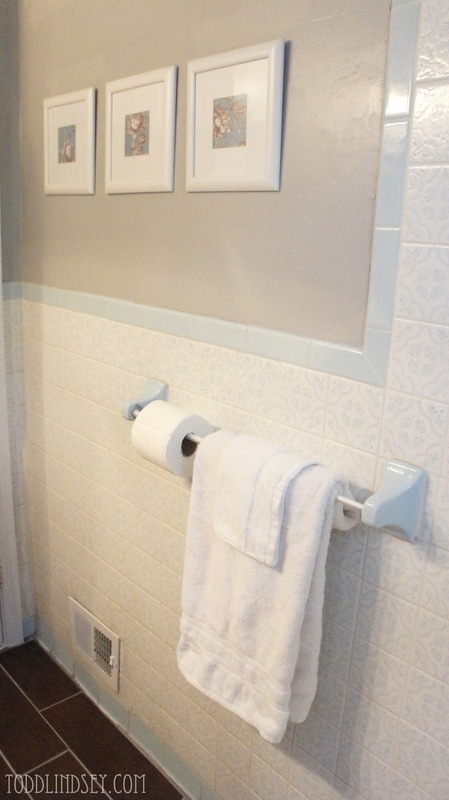 And there's our toilet paper, still on that towel/tension rod thing! 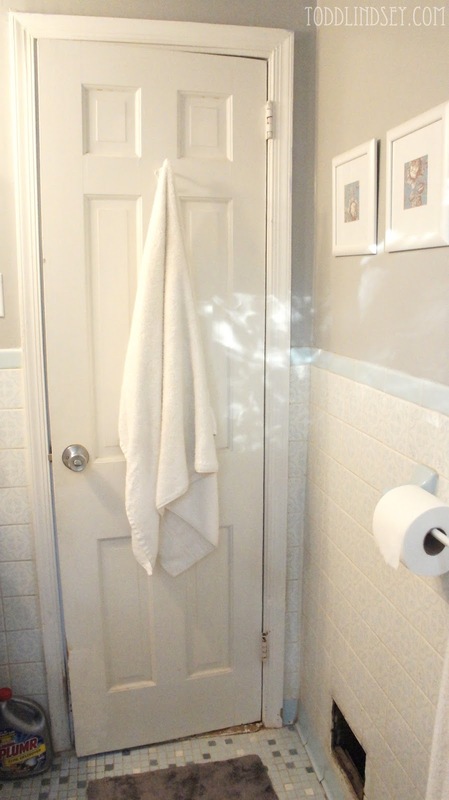 This is the perfect place for a guest towel. Or the dog's towel. Or a child's towel, whenever that happens. These white towels were a wedding gift from Todd's aunt. I don't know what it is about white towels but it just feels luxurious using one. 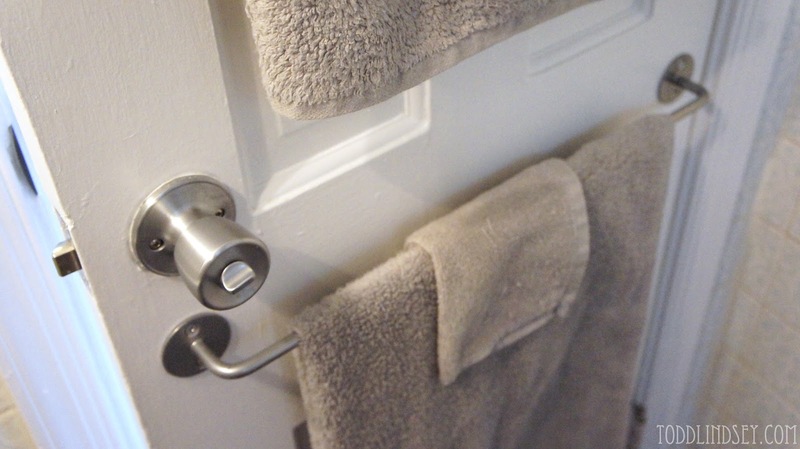 And where do we keep our towels? Why, behind the door, of course! 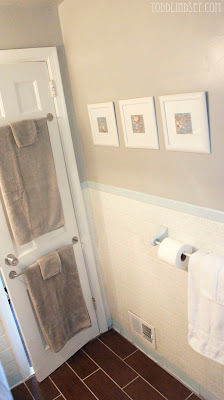 I got two towel rods from Ikea for only $2.99 each. What a steal! I also got some hooks to hang on it, which I forgot to put out for the pictures. It's a 10 pack of hooks for 99 cents. I figure it can come in handy for hanging clothes to dry or whatnot. Here you go. Final result! Hope you enjoyed the tour! Here is a breakdown of costs. 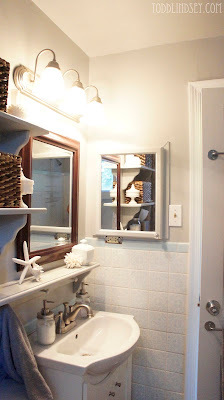 This is such a beautiful bathroom! I love love love the flooring. :) You have such a talent for decorating. It looks gorgeous! Love the shelves with baskets! And I'm drooling over your floor!!! Nice job! You made it practical, economical, and pretty!!! High five for a job well done! Ooooh! Aahhhh! It's gorgeous! The milk glass adds so much elegance to the space. 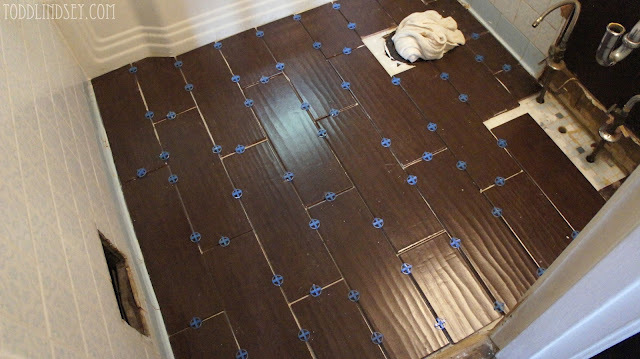 Okay and the floor tiles: LOVE! I saw those on TV and I thought they were so cool. 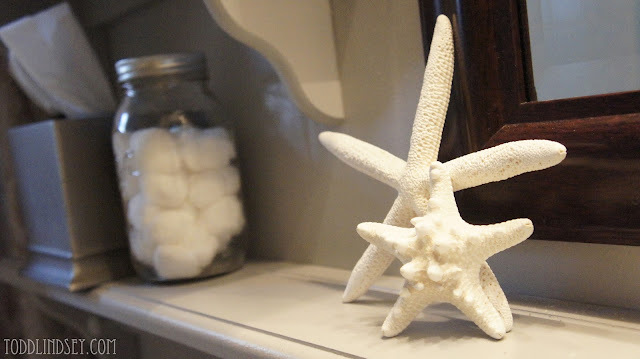 They look awesome in your little space. 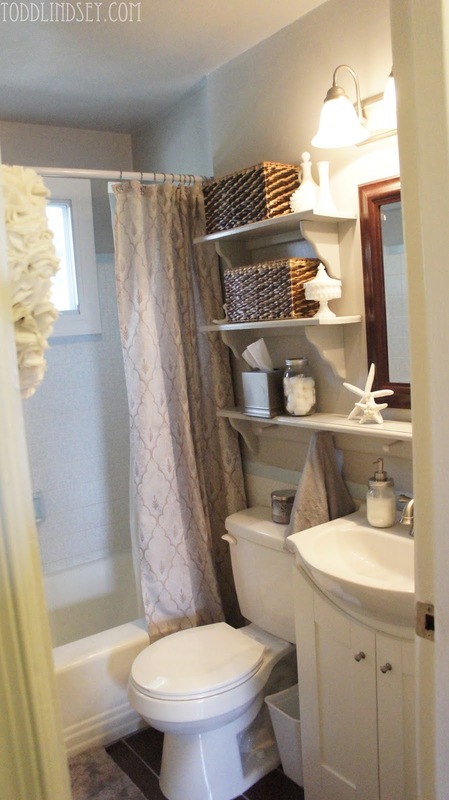 All the serene colors you chose make everything look modern and very spa! Awesome job! Terrific transformation. the bathroom is lovely. 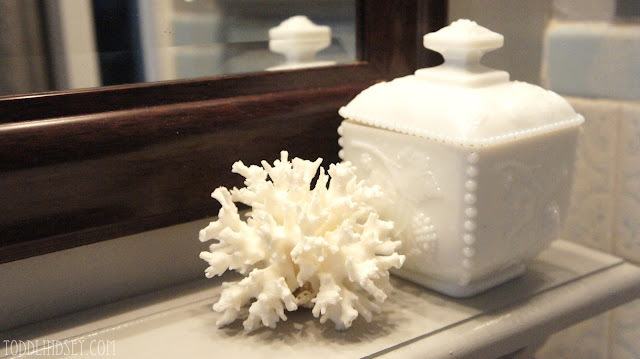 I love the finishes you chose and the accessories are all just the perfect touch. Very well done. For a small bathroom it has a very elegant feel to it. Ah lady it is super awesome!!!! I mean...the floors completely rock as does everything else!! I can not get over that you came in under 1000 dollars!!! Super amazing! 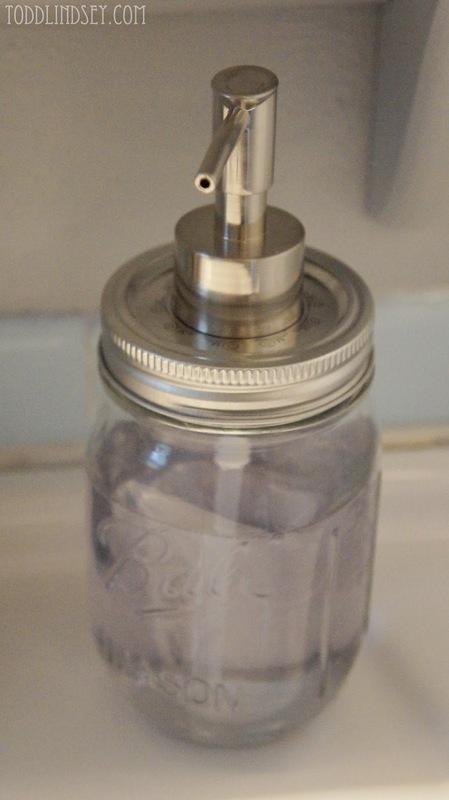 And the mason jar is super clever!!! I need shelves like those! Where did you find them??? Great work on this one!! I just pinned the heck out of this post. 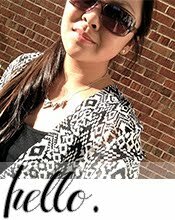 Your shots are great and I wanted to capture so many ideas here. You deserve a big pat on the back. You made a swan out of an ugly little duckling. I have a similar bathroom ordeal except all my tile is mauve. 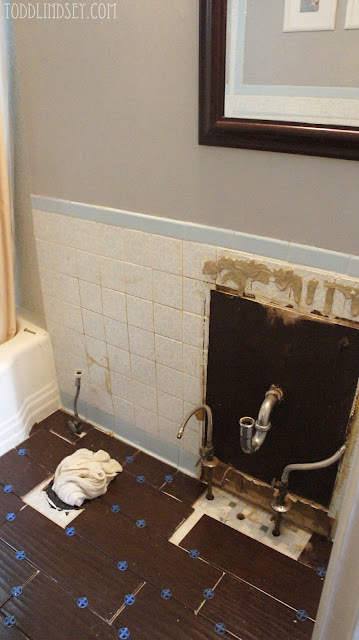 We don't have money now to do anything with it, and honestly, I can't figure out how I could ever work with mauve tile everywhere as beautifully as you have done here. Love! What a change, Linsey and Todd! All of your hard work and clever thinking and planning have really paid off, with this project. 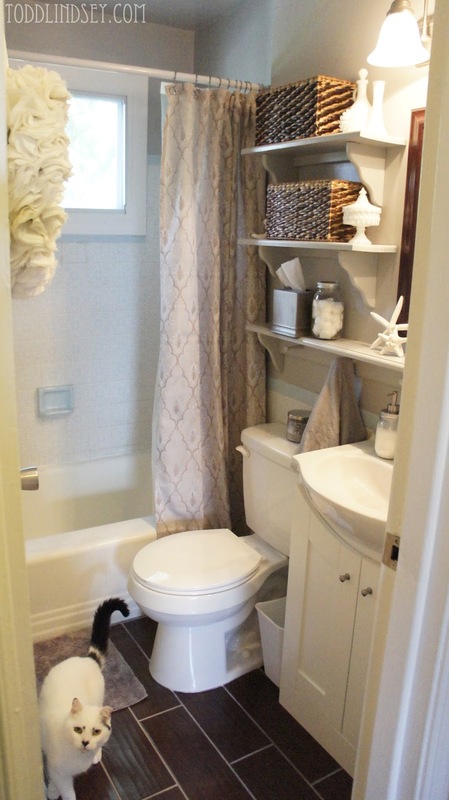 I am so delighted with your finished bathroom, and so must you be, too. It looks like there is 50% more usable room now! Everything is So Well Done. You two make a fabulous team! Lindsey, you can get your bathtub "painted" with a new finish. When we were selling our house, our tubs were gross and needed replacing. Like you, we couldn't afford that OR Bath Finishers, so we looked into this option. 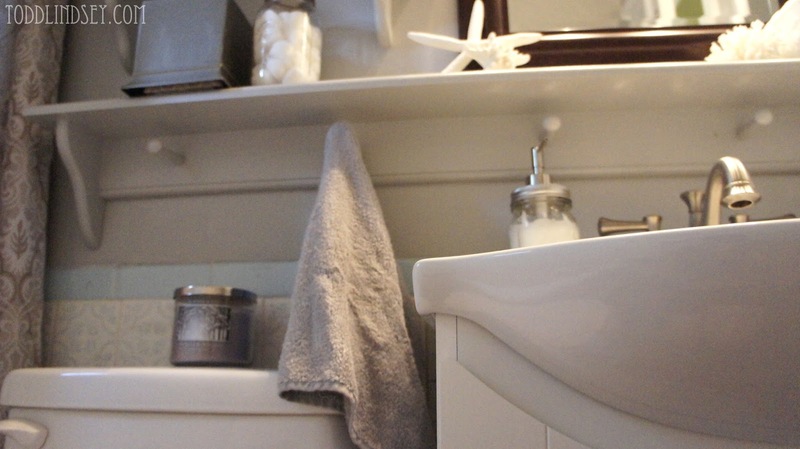 Rather inexpensive and you can use your bathroom within 24 hours. I'm not sure where to send you to find a contractor as it's been about 10 years since we did it. 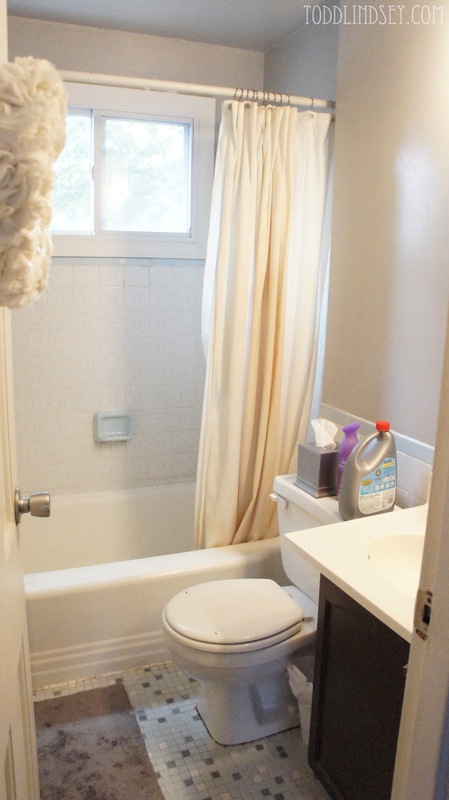 But, maybe call a plumber or google bathtub finishes. Good luck. And the bathroom looks fabulous! It's beautiful! I love the texture, it's not at all overwhelming but just enough. 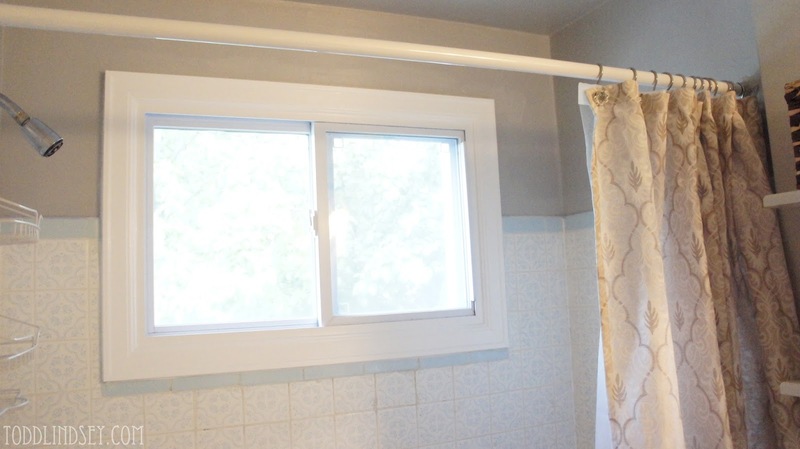 You need two shower curtains. 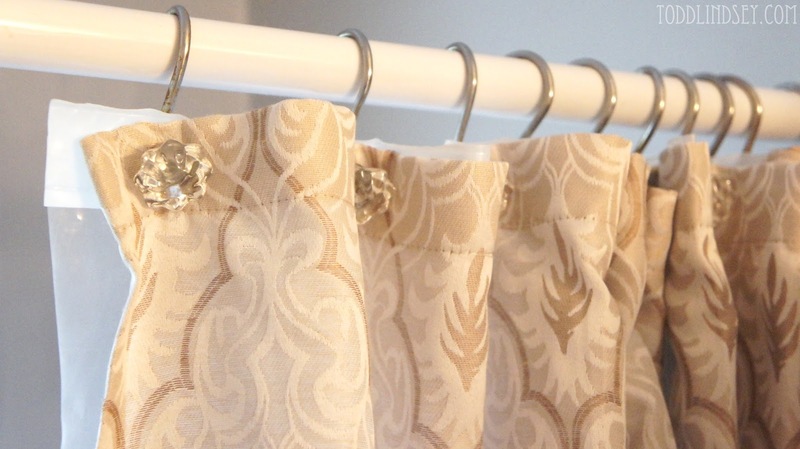 Hang one curtain with your cheap plastic curtain....then in front (and a tiny bit higher) hang your pretty curtain. Scoot your pretty curtain to the side when showering, then close both when done so the plastic one dries with out creating more nasty mold. I've found it works better than putting both curtains on the same rod. 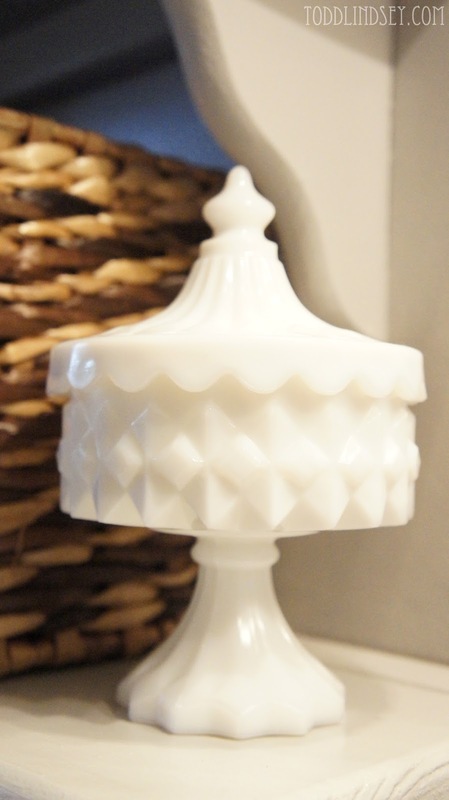 The pretty one stays nicer longer, and it's easy to replace the plastic one (because it gets gross and so worth the $3 bucks to replace every now and again) without having to take down the pretty one. Great job. It looks fabulous! Wow, Lindsey! Wow! You did an awesome job! Love the color, love the decor, love the shelving, LOVE the tile (we've purchased it for a project we're working on right now too!) It's stunning! I'm sharing a link back in tomorrow's DIY highlights! Thanks so much for sharing your hard work! It's gorgeous! Very, very nice! I'm in the middle of redoing our guest bathroom and it pretty much has the same layout as yours. 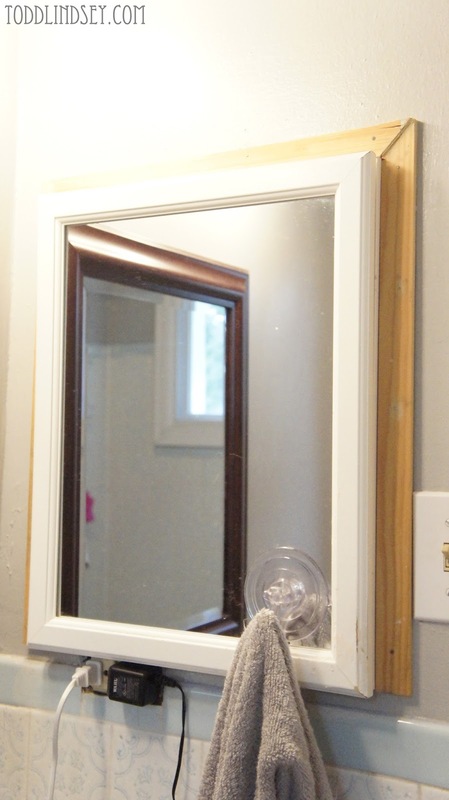 I've had my eye on that vanity...$99 is an awesome deal. 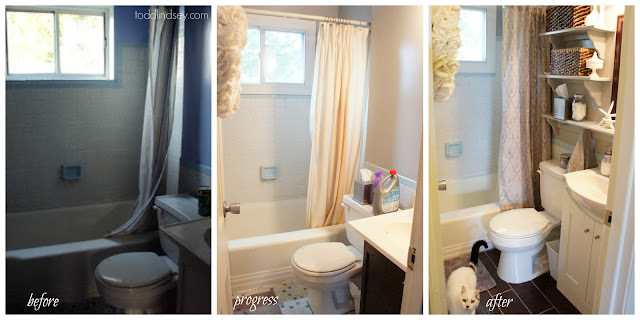 I love that shower curtain too! Thank, kiss, hug and cook dinners for your in laws for at least a month of weekend nights. You skated right on by with all the work they did...... I will even thank them! Fantastic job! You have inspired me to start working on our bathroom - we also have a tight budget for it. I just love how it goes from dark into super simple yet elegantly light and the white stuffs are so refreshing in the eyes :) Good job!